Giving has never been easier with the GiftTree Gift Card. Always a pleasure to receive, our Gift Cards allow your lucky recipient to browse a wide selection of delicious gift baskets, noteworthy wine selections, fresh flowers, engraved gifts, and much more - and then choose exactly what they want. GiftTree Gift Cards are offered in a variety of denominations to suit the occasion and will arrive elegantly presented in a Gift Card holder within an envelope. You will also have the opportunity to write a personal message to the recipient. Promotional codes may not be used to purchase Gift Cards at this time. 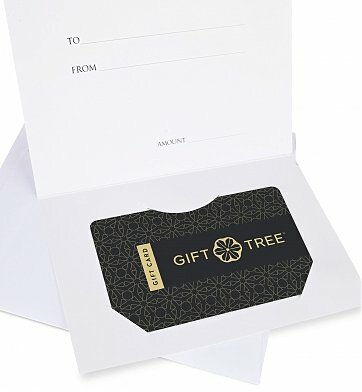 GiftTree Gift Cards do not have an expiration date. GiftTree Gift Card is a hand delivered gift. These gifts are delivered by one of our local design centers located throughout the United States and Canada. Same day delivery is available for most gifts when ordered before the cutoff time. The cutoff time for GiftTree Gift Card is 2 PM in the recipient's time zone.